"Hail to the President! Hail to the Chief! "- Albert Gamse. 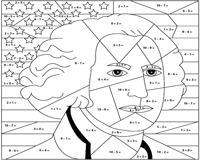 Let's celebrate the lives and contributions of George Washington and Abraham Lincoln and the lives of all the 45 presidents of US with this set of Presidents' Day worksheets for grades k-5. Featured here are fun activities like coloring, dot-to-dot, alphabetizing, identifying presidents, word search, making words and sentences, writing prompts, president research project, addition, subtraction, multiplication and division puzzles and a lot more! Kick-start the creativity and imagination of kids with this worksheet. 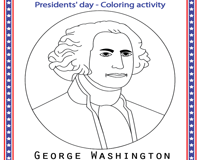 Tell kindergarten kids about the first president of the US and his service to the country. Help them identify and color his picture. Stimulate curiosity, develop color recognition and sequence numbers from 1-45 with this join the dots worksheet. Learn about the tallest US President who was fondly known as 'Honest Abe'. 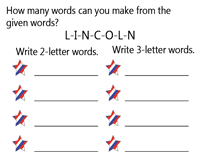 Bolster alphabet sequencing skills with this first and second grade worksheet. 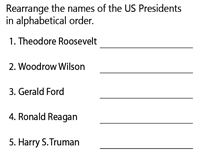 Rearrange the names of the US Presidents in alphabetical order. Check the first letter and alphabetize the names. 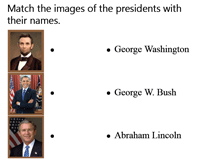 The kids of grade 1 and grade 2 are expected to identify the six former presidents of the US and make a one-to-one correspondence between their names and images in this matching worksheet. 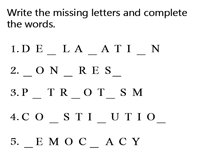 Supply the missing letters and complete the 12 words associated with Presidents' Day. Enhance the spelling skills and enrich the vocabulary of children of grades 3 and 4 in the process. Hidden in this 14x14 grid, are 10 words related to the United States of America. 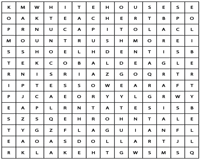 Hunt for the words horizontally and vertically in this Presidents' Day word search worksheet to know your country better. Rattle your brains with this word making challenge worksheet for children of grades 3,4 and 5. 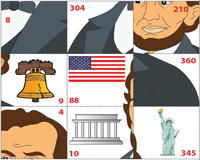 Try making as many 2-letter, 3-letter and 4-letter words as you can from the names of the famous US Presidents. Sentence making can't get more interesting than this! 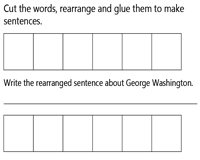 Snip the word cards and rearrange them to make a sentence about each of the two famous presidents of the US and write the sentences in the given space. 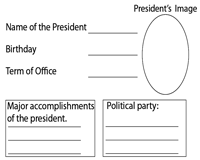 The image of a president is hidden in this worksheet. To reveal the mystery picture all you have to do is add or subtract the numbers, map the answers to the color key and color the image accordingly. Picture puzzles are a great way to review and recapitulate concepts. 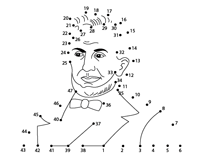 Multiply and divide the numbers, snip the puzzle pieces, map the answers and glue them to complete the puzzle. 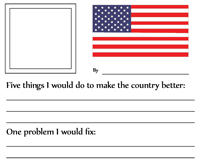 Spark your imagination with this fifth grade writing prompts worksheet on 'What would you do, if you were president?'. List the things you would change, the laws you would enforce and the problems you would fix. Know your favorite president a little more with this President Research Project. Collect information about the president of your choice, glue his picture, write some interesting facts and describe him as well.